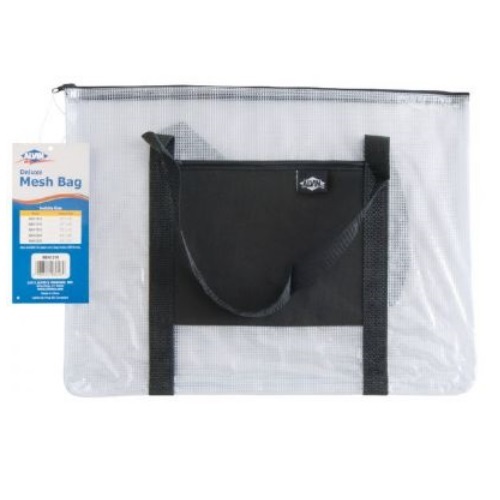 Alvin NBH1216 - NBH Deluxe Series Deluxe Mesh Bag 12" x 16"
Alvin NBH Deluxe Series Deluxe Mesh Bag 12" x 16"
Ideal for drafting kits, drawings, artwork, documents, and much more, these bags offer visibility and protection. Durable see-through vinyl is reinforced with mesh webbing for strength. Features a zippered top, nylon carry handles, and an exterior black nylon zippered pocket that’s perfect for smaller items. ¾" wide gusset. Packaged flat with cardboard stiffener. 12" x 16". Alvin NBH1013 - NBH Deluxe Series Deluxe Mesh Bag 10" x 13"
Alvin NBH1313 - NBH Deluxe Series Deluxe Mesh Bag 13" x 13"
Alvin NBH2026 - NBH Deluxe Series Deluxe Mesh Bag 20" x 26"
Alvin NBH2331 - NBH Deluxe Series Deluxe Mesh Bag 23" x 31"